If you are headed to Google I/O, you will be excited to learn that there is a new update to the official application that took place in Google Play last night. 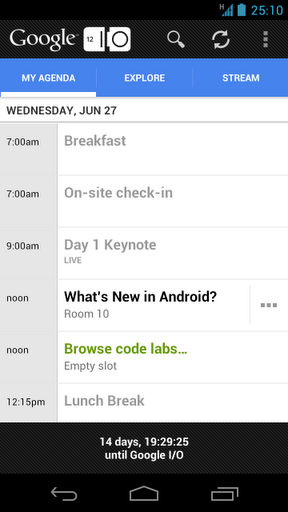 The update, targeted at people who will attend the event this year, includes new push notifications to receive “announcements and the conference schedule from the Google I/O team,” along with the ability to view the whole conference’s agenda. If you plan to watch the conference from home, the application can now be installed to your Google TV and supports full live streams of the conference through it. [The update] Improves spacetime decompression algorithms; 29 total hours per day are now available to Google I/O attendees within Moscone West. It could be Google being their normal slightly-geeky selves or they could be hinting towards something we’ll be hearing about at I/O. Well, we don’t have to wait much longer. Go grab the update from Google Play now.